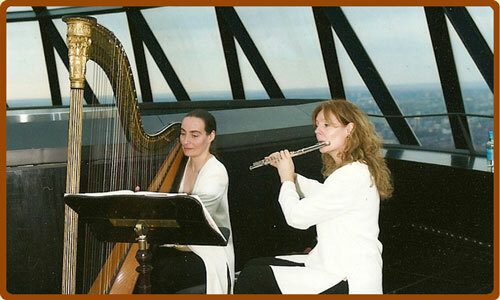 This flute and harp duo perform a varied programmes of elegant and sophisticated music to suit all tastes. They began working together in 1996 and their styles vary from light classical to more contemporary music, folk music, Bollywood and Kletzmer. 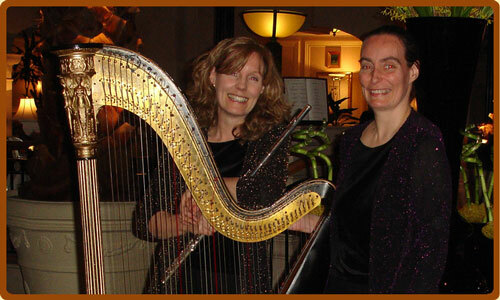 They are very experienced at playing for all types of occasions, both private and corporate functions. 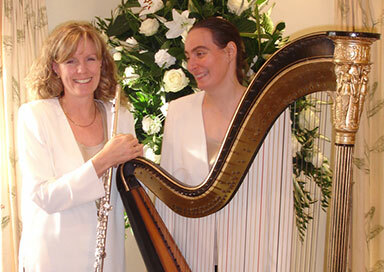 They often play for weddings, both religious and civil ceremonies. They also perform for receptions and private occasions such as barmitzvahs, christenings, engagement parties, birthday lunches/dinners and anniversary parties. 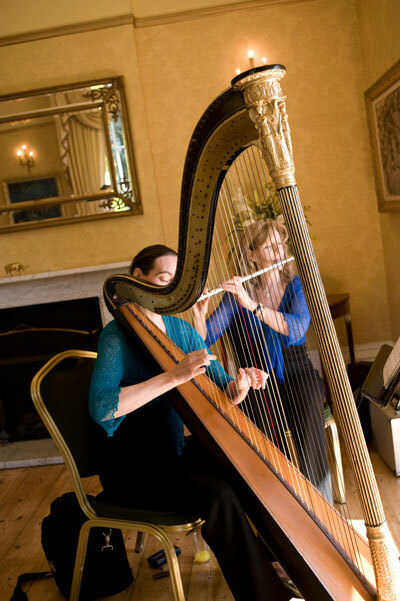 The duo are always very happy to advise or help with selection of music and can usually arrange special pieces for you at no extra charge, making your occasion unique and tailored to your very own requirements. The Flautist studied at Guildhall School of Music and Drama in the City of London. She enjoys a busy professional career as a freelance musician, playing in orchestras and smaller chamber ensembles. She has toured in both the UK and also abroad, being regularly engaged to play in the Far East. She can often be seen performing in concerts at major London concert halls including the Royal Festival Hall, Barbican Centre and the Royal Albert Hall. She also performs for weddings and private or corporate functions at prestigious London venues, such as Claridges, The Grosvenor House Hotel, The Dorchester, Landmark and Savoy Hotels. The Harpist studied at City University, London and has a wealth of experience in the entertainment industry - beginning her career when she was just 19. She enjoys a varied professional career, being engaged by many private individuals and corporate organizations both in the UK and overseas, including the Middle East. She has also regularly performed at five-star London venues, including the Intercontinental, Hilton and Regency Hotels. She has also worked as a harpist for promotions in retail outlets and in various country clubs. The duo have been performing together since 1996, and bring a top level of expertise and professionalism to every engagement. They work closely with every client, bringing a unique approach which ensures that each event at which they perform is truly successful.